Jaye Robin Brown lives and writes in the mountains north of Asheville, North Carolina. NO PLACE TO FALL is her debut novel. It’s about dreams, singing, friendship, love, betrayal, family, and mistakes. It’s also a love song to small town girls and mountain music, both of which shape the area that Jaye now calls home. NAW-When did your literary journey begin? At what age did you discover that you wanted to write? There is no early defining moment for me. I always loved English classes and writing assignments. My parents’ friends would often comment on my writing skill in thank you notes. I read far above grade level and was a voracious reader. My eighth grade English teacher, Mrs. Smith, was the first person I remember really honoring that proclivity. She made sure my poetry was published in our school’s literary magazine and always encouraged me. In college, I veered more to the visual arts side of my brain and stayed there for quite a while. But the whole time I was writing journal entries, poetry, vignettes, scraps and thoughts. I wrote a couple of magazine essays for fun and had a regular column in our local newspaper, but oddly enough I never considered myself a writer. It was in 2009 that I decided I was going to seriously pursue a path to novel publication. So even though I’ve been around for a bit, this part of my life is somewhat new if we’re talking about novels. 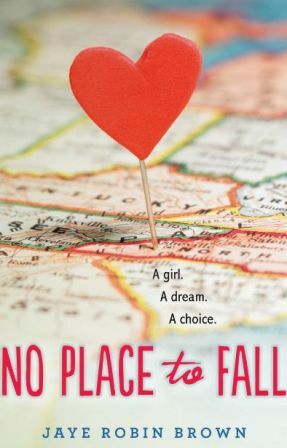 NAW- Tell us about your book, ‘No Place To fall.’ How did you get the idea for it? How long did it take to finish the book? No Place To Fall is the story of a girl with a dream bigger than her circumstances. Amber loves to sing and as she begins to realize her talent is special, she starts to long for more. A representative from the NC School of the Arts plants the seed that maybe there’s more for her than her small mountain town. But Amber’s family has issues and she must navigate a series of choices if she wants to realize her dream. Ultimately, it’s a coming of age story about dreams, choices, first romance, and life’s hard realities. My ideas typically start with a combination of events and ideas and that was true with this story. The music from the movie, Songcatcher, an overhead conversation between teenagers in my classroom, and Amber’s voice screaming into my brain one morning all blended to become the genesis of this story. In all, from first words to turning in copy edits, the process lasted about a year and half. But there were lull points in there when I worked on other projects. NAW- Tell us about Amber Vaughn. How did you develop the character? What are her best attributes? Amber Vaughn is a deeply good person. So good, that she often finds herself needing to be the adult in her family. As her dreams grow bigger, so does her desire to live a bit more for herself. Like any typical teenager, she makes some mistakes driven by personal need. As far as developing her character, I can’t say there was a conscious molding of attributes. I write very intuitively and my characters grow and develop as I write and revise and get to know them. What I love about Amber is her huge heart, her forgiveness, her humility, and her incredible bluegrass voice. NAW- Why did you choose to write young adult fiction? How difficult (or easy) is it writing for the youth? I’ve always written for young people. I’ve tried my hand at picture books (surprisingly difficult), middle grade (a dream not yet dead), and young adult fiction. As a teacher, parent, avid reader of books as a young person myself, this voice is where I’m comfortable. I’ve thought about writing adult fiction, but I’m not sure how that would fit for me. As far as level of difficulty, it’s hard for me to say. Writing is hard. Whatever you’re writing, if you’re trying to be true to your character, story, voice, there’s work to be done. NAW- Do you carry out any research for developing your characters and your stories? How do you go about it? Sometimes. In No Place To Fall I had to do research about the admissions process for the NC School of the Arts, including the audition list. Luckily, one of my writer friends from Twitter works there as the librarian, so she helped me out. In going through the audition list and looking up performances on Youtube, my process was much like my MC, Amber’s process of discovery. My own research translated very well for the writing. I’m working on a story now with a Latina character and I’ve done tons more research. Much of it online, and much of it talking to the undocumented students at my high school. They are more than happy to open up to a friendly, non-judgmental ear. There is really no one author I’ve tried to emulate or shape a career on, but I do have some early constants in my life. I love Barbara Kingsolver’s writing for sense of place. Tom Robbins has also been a favorite for his quirky characters and human interactions. I wouldn’t be a good Alabama native if I didn’t mention Harper Lee’s To Kill A Mockingbird. Her championing of the underdogs is very much in line with my own sensibilities in theme. As for Young Adult contemporary literature, I really love Nina LaCour, A.S. King, and Laurie Halse Anderson. I live on a small farm and am the steward to fourteen acres, four horses, three dogs, three cats, a goat, a rooster, and two hens. So that takes up much of my non-writing time. Along with being a farm girl, I’m a high school art teacher and work full-time during the days. If there’s any time leftover after all that, I read, cook, have dinners with friends. I love to go to the movies and jump at the chance to see art exhibits and go to museums. And music, I love going to hear live music! NAW- When reading, do you prefer a print copy or an ebook? Print books, definitely. I love holding a book in my hands and turning the pages. NAW – Tell us about your literary journey. How easy (or difficult) was it to get your first book in print? In hindsight, now that the difficulty is over, it seems easy. But the reality was quite different. I wrote my first novel length thing in about 2001. Then I stopped writing for a bit. In 2009 I decided to get serious about publication and began a journey that included creative writing class, children’s literature organizations, and online forums. I snagged an agent. I thought this is it! Said agent shopped said manuscript and it didn’t sell. Said agent dropped me. That was a pretty devastating day, but fortunately it didn’t last long. I’d heeded the good advice to keep writing and decided instead of grieving, I’d finish the book I was working on. I started querying it in late June of 2012 and had signed with my current agent by August 2012. The manuscript of No Place To Fall sold to the first editor who read it and the whole deal went down at a NYC lunch. But…No Place To Fall was my sixth novel length manuscript. I’m currently working on my second book in my deal with Harper Teen. It’s also a stand-alone contemporary. Because it’s early in the editing process I’m hesitant to say too much about it, though it does deal with the plight of teens navigating life in the USA with undocumented family members. Beyond that I have a half-finished historical middle grade manuscript, also dealing with immigration and prejudice, a couple of previous manuscripts I’d like to look at again with more knowledgeable eyes, and one big burning shiny new idea that I’d love to draft.